Pomella AnDone is born as a commoner in her village minus the luxury of a noble life or the silk gowns, but with a powerful voice that channels the Myst from the nature. In her village there is a tradition, that once in a while the High Mystic will choose a candidate among the noble and privileged families to compete against one another to become an apprentice under the High Mystic. But during the spring fest in Pomella's village, a messenger arrives from Kelt Apar- the home to the High Mystic, with the message that the new High Mystic has summoned Pomella to compete in the competition with other noble candidates to become a Mystic. Against the tradition and the rules, Pomella journeys to Kelt Apar to become a Mystic but little did she knew that the noble families whose sons and daughters are competing against her are plotting an agenda to stop her from becoming a Mystic. 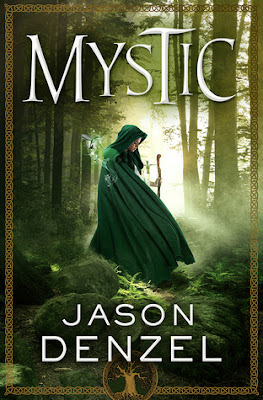 Welcome to yet another fantasy series which has the elements of magic and other magical creatures, thus providing a vision into the make-believe world created by the author. For me, the world development matters a lot when it comes to fantasy stories and that has been handled by the author so flawlessly. The world that he developed is convincing and described with great details and even a map to understand the land and the names of the places. The author's projection of this world is vivid thus letting the readers take a voyage along with the young heroine through the forests towards Kelt Apar. comprehend with. The narrative is appealing and free-flowing and has the power to keep the readers engrossed into the story line till the very end. The pacing of the book is fast and the thrilling adventure as well as the three trials will keep the readers on their edges. There is an air of mystery which has been depicted by the author satisfyingly with enough twist and turns but unfortunately they are easy to anticipate. The characters are well-developed highlighting both their strong ans weak attributes. The main character, Pomella, is more like a Katniss-kinda girl, brave and fearless and someone who also cares about her family a lot. But unlike Katniss, Pomella is sociable and has friends and even a boy who likes her a lot, and not to mention, there is a love triangle, so if you're against teenage love triangles, then it's better, if you skip this book. The romance is a big negative for me in this story as I will say that it has not been featured with enough passion or heart-felt emotions to make me feel it. There are some characters which are magical and their witty and adorable demeanor makes the story even more interesting to read. There is a mild cliffhanger in the climax which will definitely make the readers vouch for the next book in the series. Well, in a nutshell, this is a promising fantasy story from a newbie author which is extremely intriguing and thrilling to the very core of the story line. Verdict: Here comes a compelling and exciting new series that you definitely need to look out for. Courtesy: Thank to the author, Jason Denzel's publicist for providing me with a copy of the book, in return for an honest review. I'm Jason Denzel, and my debut fantasy novel, Mystic, will be released November 3rd.